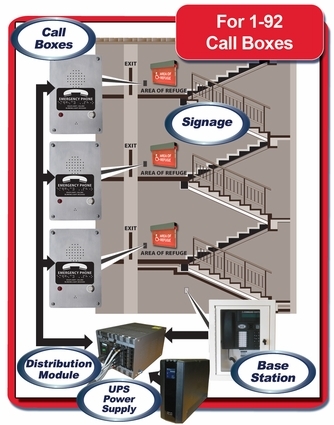 The 4800 Digital Emergency Communication System Cornell Area of refuge is designed to provide fully supervised, two-way voice communication, between each area of refuge call station and the Main Control Panel. 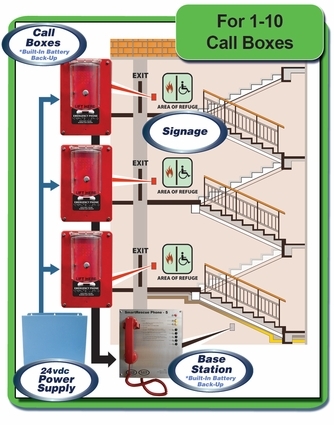 Optionally, up to (4) Remote Control Panels can also be installed throughout the building to allow alternate locations to respond to a call for assistance. An internal modem, operating at the Main Control Panel, connected to a Analog “POTS” dedicated telephone line, provides an automated-timed dial-out capability to a monitoring location. 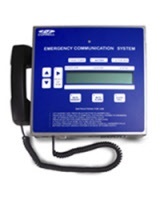 The 4800 Digital Emergency Communication System shall poll (supervise) all the Call Stations, area of rescue control panels and Expansion Switches on a continuous basis, to identify line faults and defective equipment. Activated Call Station locations and fault information will be alerted and displayed at the 40 character LCD four line display, at each Control Panel location. Each 4800 V call station is equipped with an auxiliary set of momentary form “C” contacts that can be used to activate external devices, such as a camera, strobe, or tone device. There are no children categories of Cornell 4800 Series.